The Highland Wood News has recently introduced a new monthly column, by popular demand. It seems there are quite a few woodcarvers in our ranks, and we’d like to give them a little more attention on the pages of Wood News. So we’ve started the Show Us Your Carving column, in which a different woodcarver’s projects will be featured each month. This past month we featured the work of Kari Hultman, who you may know better as The Village Carpenter. 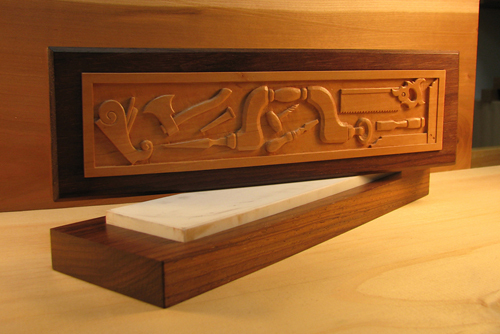 Kari has been writing a really excellent woodworking blog for many years, and it is always a fun read. Although she has been working with wood for almost 19 years, she has only recently attempted relief carving. Looks like she has already taken to it beautifully though! Take a look at one of her impressive pieces below, and CLICK HERE to read the entire column, which features more of her carving works. If you are interested in having your work featured in a future Show Us Your Carving column, we’d love to get PHOTOS of your favorite woodcarving projects along with captions and a brief history of your woodcarving. (Email photos at 800×600 resolution.) Receive a $50 store gift card if we show your carving work in a future issue!